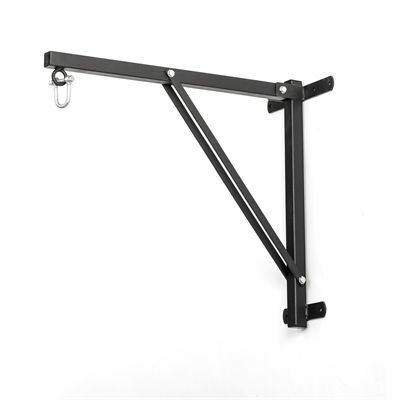 The Carbon Claw Impact GX-3 24 inch folding punch bag wall bracket can be easily bolted to the wall thanks to 6 fixing points ensuring a strong and sturdy fit. It offers a folding mechanism for space-efficient storage and can be used with punch bags up to 30kg (66lbs). Extra durability is provided by a hardened black texture powder coat finish and there is an included replaceable eye bolt swivel fixing. This robust 24” (60.9cm) metal bracket is supplied with assembly instructions. Caution: For safety reasons, the bracket should be fixed to brick walls only. for submitting product information about Carbon Claw Impact GX-3 24 Inch Folding Punch Bag Wall Bracket We aim to answer all questions within 2-3 days. for submitting product information about Carbon Claw Impact GX-3 24 Inch Folding Punch Bag Wall Bracket. We aim to answer all questions within 2-3 days. If you provided your name and email address, we will email you as soon as the answer is published. for submitting product review about Carbon Claw Impact GX-3 24 Inch Folding Punch Bag Wall Bracket.